The Victory HTLS tiller is a professional tractor tiller for thorough tilling any kind of soil on medium and larger sized land. The working width of 140cm to 200cm and the four-way adjustable working depth of up to 18cm makes the Victory HTLS tiller superior to standard tillers in this price segment. In contrast to other tiller offered in the market, we use between 42 and 60 specially hardened blades made from alloy steel, each with a weight of 720gr. Unlike other tiller using a chain or belt for transmission, the Victory HTLS tiller is using a heavy maintenance-free oil bath gear transmission, letting the laser balanced blade shaft run smoothly through even heavy and hard soil. Underneath the tiller´s massive up to 6mm strong steel housing sits the laser balanced shaft with flanges in 25cm distance, each equipped with 6 specially designed blades. The blades are made of hardened steel and can be individually exchanged or regrinded. The reinforced free-wheel transmission lets the rotor shaft of the tiller turn, once the PTO is switched off, so that its movement will not be transferred to the tractor. 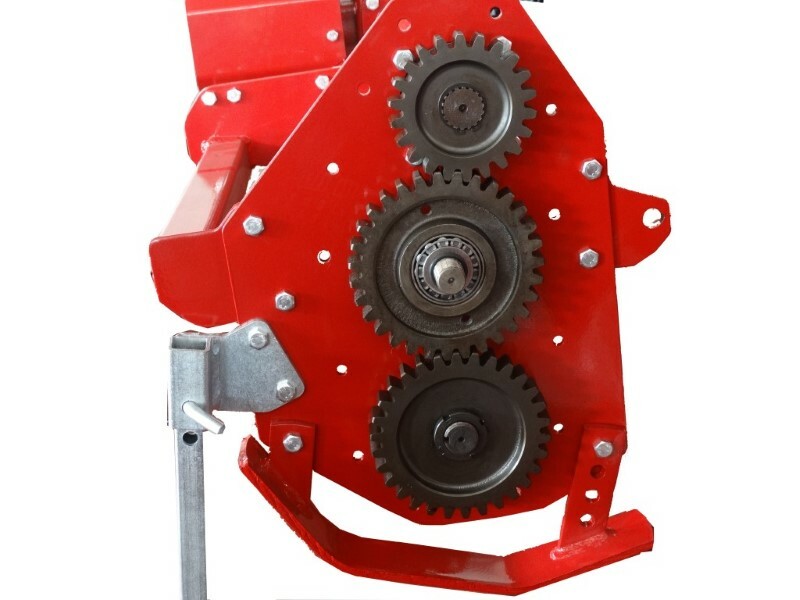 The PTO shaft supplied with the tiller has a friction clutch for a perfect protection. The lower hitch Cat I / II connectors of the tiller can be adjusted to perfectly position your HTLS tiller behind your tractor and according to its track width. The completely assembled HTLS tiller is delivered in the massive Victory wooden crates. Just the 3-point hitch and the PTO shaft protector have to be assembled to the tiller, taking you less than 20min. We offer a multilingual user manual and assembly guide with photos to assist you. The Victory HTLS tiller complies with all safety regulations and is CE tested following the 2006/42/EC machine directive. We from Victory Tractor firmly believe that you will not find a better value for money heavy tiller in the market, please feel free to compare our product to the others in the market and we are sure you will agree.